A civilian employee of the New York City Police Department was recently killed in an accident when a tire flew off a garbage truck and hit his car. The accident comes after the truck company had been cited for a series of safety violations. Continue reading for more about the accident, and contact an experienced New York truck accident lawyer with any questions. A 64-year-old New York man who worked maintenance at the NYPD headquarters in Manhattan was heading east in a 2003 Chevy Tracker on the Gowanus Expressway in Brooklyn in the early morning when the rear tire of a 2009 Mack garbage truck driving the opposite direction accidentally dislodged. The tire went over the center median and struck the windshield of the Chevy, shattering the windshield and injuring the driver. The driver was found unconscious and rushed to NYU Langone Hospital in Brooklyn where he died from his injuries. The garbage truck was operated by Century Waste, a trash hauling company with a series of safety violations according to federal records. Sixty-five percent of Century Waste trucks have been deemed unfit to drive at some point, as have 10 percent of its drivers. This is well above the national average for private waste hauling companies, which is 20 percent for vehicles and 5 percent for drivers. One inspection this February found “wheel fasteners loose and/or missing” and “axle positioning parts defective/missing,” exactly the kind of equipment defect that could lead to a tire flying off. If the company’s unsafe practices led to the tire coming loose, the company is likely liable for the death of the driver and could face a serious lawsuit from the estate of the deceased NYPD employee. Commercial trucks are not the only vehicles losing tires on the road in New York. Less than a month before the garbage truck accident, a tire came loose from a trailer heading eastbound on a Sunrise Highway on Long Island at around 2:15 p.m. on a Thursday. The 48-year-old driver was towing a 2004 Ringo trailer with his Ford pickup truck when the tire dislodged and hit a 1998 Saturn sedan, then bounced and struck a 2000 Chevrolet SUV. The Saturn driver was killed, while the driver and passenger of the Chevrolet were not injured. The Ford driver did not notice he had lost the tire when the accident occurred, but he came forward to police the next day after finding that the tire was missing. He surrendered the truck and trailer for safety evaluations. 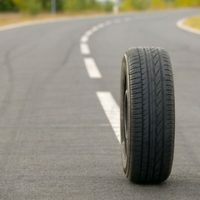 If you or a loved one has been injured in a New York truck or tire accident, contact Leandros A. Vrionedes, an experienced Manhattan vehicle accident attorney, for help making the right claims against the right parties, and, ultimately, obtaining maximum compensation for your injuries and damages. In Manhattan, call 212-889-9362, or in Queens, call 718-777-5895. Your first consultation is free, and you owe nothing unless we recover on your behalf.